Home The FOLIO Critiques: The Reasoned Insights of Nancy Honea. Advisory Board Member Nancy Honea led the fall 2018 critique session in October. What comes out of listening to her manner of critiquing are philosophies that could apply to many aspects of life in general, but also to a specific painting challenge. As the evening began, she shared her personal process stating that, before beginning a painting, she does a full-size preliminary charcoal. Why? Because you can judge a work even at this stage. It helps you spot any compositional or design pitfalls early and keeps you on track. Some of the work submitted for Nancy Honea’s critique. 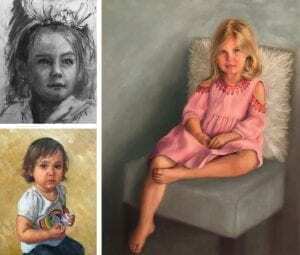 Top left: charcoal by Amanda Mattison; bottom left, oil by Rebecca Kemmerer; right, oil by Donna Leonard. She begins each critique with a few simple questions for the artist. It helps her understand the artist’s own big picture: their history, motivations, painting style, and expectations for this particular work. She takes time to process the “big picture” before offering advice. Here are some of her comments. Making the whole canvas work together is important. All the work doesn’t just go into the face. Tie all the elements together, including environment, patterns, and textures. Lots of activity in a painting is not bad if it’s cohesive. A painting is, and should be, more orchestrated than a snapshot. Look at the corners and edges of your canvas, treat them differently than you would the center. Be aware. There are solutions for every problem, but these solutions may also create new problems. Enjoy the process of solving problems. You may think it’s what you put into a drawing that makes it work, but it’s sometimes what you take out that makes it successful. You can obsess on one aspect/part of a piece. But if the viewer notices that you’ve done it, then it’s contrived. When you’ve been working for days and days on a piece, you can lose the ability to judge. Turn it upside down and study it or look at a reflection of it in a mirror to get a fresh view. There are some pieces that you’re “done” with and you’ve learned all you can from them. But there are others that you can go back to and work on again and learn more. Repetition needs variation. Something in our brain wants repetition, like a line of trees, or a pattern of stripes, to be consistent. But we must fight that to make things lyrical. We should intentionally vary the sizes, shapes, and widths. To find your own path, rather than experimenting with different artistic styles, find a method or technique that works for you. When it clicks, paint it over and over again, and you’ll develop your own style. Never let anything stand in the way of fixing something. If you’re working from a photo and what you have doesn’t work, go back and take more photos. Hire a model or get a friend to pose. When you’re at the canvas, you are the painter. But when you step back, you’re looking with the eyes of the viewer. A painting should look good from a distance, not only up close. Take time to step back frequently when you’re working.